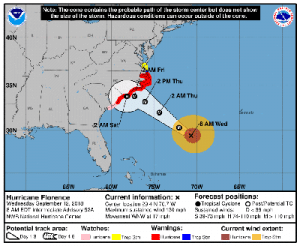 Freight and passenger carriers in the southeastern U.S. have announced disruptions to service in advance of Hurricane Florence, which is predicted to make landfall along the Carolina coast Thursday. Norfolk Southern (NS) has closed its headquarters in Norfolk, Va., in compliance with an evacuation order issued Tuesday by Gov. Ralph Northam, Trains magazine reported. The magazine also reported that intermodal shipments destined for NS’s two terminals in Norfolk and to the Virginia Inland Gateway were stopped on Monday in anticipation of the storm. The carrier said on its website that traffic bound for destinations affected by embargoes caused by the storm will be held at yards throughout its system. Trains magazine also reported that CSX activated its hurricane action plan and said the carrier’s shipments progressing through the Interstate 95 corridor likely will experience storm-related delays. Rail service to and from Portsmouth, Va., was to be halted by CSX on Tuesday and its terminal there closed Tuesday evening, the magazine reported. The magazine also said that the carrier was going to close its Charleston, S.C., terminal this evening. Amtrak announced earlier in the week that trains in the Northeast Corridor will not run south of Washington, D.C., until the storm passes, and a number of trains have been canceled or modified this week in anticipation of Florence.